Friday, January 3 – Solo piano – Private event, Oakland, CA. Saturday, January 4 – Solo piano – Private event, San Jose, CA. Friday, January 10 – with the Roger Glenn Latin Jazz Ensemble at Angelica’s Bistro, Redwood City, CA. With Roger Glenn – vibes, flute, sax; Ray Obiedo – guitar; David Belove – bass; Phil Hawkins – drums, and Derek Rolando – percussion. Music starts at 8 pm. Friday, January 31 – with the Pete Escovedo Latin Jazz Ensemble at Angelica’s Bistro, Redwood City, CA. With Pete Escovedo – timbales; Juan Escovedo – congas; Roger Glenn – vibes, flute; Ray Obiedo – guitar; David Belove – bass; and Phil Hawkins – drums.Music starts at 8 pm. Saturday, February 1 – with Ray Obiedo & Mambo Caribe featuring special guest Pete Escovedo at The Sausalito Seahorse Sausalito, CA. Brazilian and Latin jazz mixed with East Bay funk, featuring Ray Obiedo – guitar, Pete Escovedo – timbales, David Belove – bass, Phil Hawkins – steel pans, and Colin Douglas – drums & percussion. Music starts at 9 pm. Saturday, March 8 – with Ray Obiedo & Mistura Fina at Silo’s, Napa, CA. Brazilian and Latin jazz mixed with East Bay funk, featuring singer Sandy Cressman. With Ray Obiedo – guitar, David Belove – bass, Phil Hawkins – steel pans and drums, Colin Douglas – drums and percussion, and Derek Rolando – percussion. 8 pm. Saturday, March 22 – with Ray Obiedo & Mistura Fina at Luna Dance Institute’s ‘Evening of Luna-cy’ fundraiser, Emeryville, CA. Brazilian and Latin jazz mixed with East Bay funk, featuring singer Sandy Cressman. With Ray Obiedo – guitar, David Belove – bass, Phil Hawkins – steel pans and drums, Colin Douglas – drums and percussion, and Derek Rolando – percussion. The Luna Dance Institute is a dance education organization which brings dance instruction to thousands of children every year. Friday, April 4 – with Ray Obiedo & Mistura Fina at Armando’s, Martinez, CA. Brazilian and Latin jazz mixed with East Bay funk, featuring singer Sandy Cressman. With Ray Obiedo – guitar, Alex Murzyn – sax & flute, David Belove – bass, Colin Douglas – drums, and Derek Rolando – percussion. 8 pm. Saturday, April 12 – with Ray Obiedo & Mambo Caribe at The Sausalito Seahorse Sausalito, CA. Brazilian and Latin jazz mixed with East Bay funk, featuring Ray Obiedo – guitar, David Belove – bass, Phil Hawkins – steel pans, and Colin Douglas – drums & percussion. Music starts at 9 pm. Friday, April 18 – with the Roger Glenn Latin Jazz Ensemble at Angelica’s Bistro, Redwood City, CA. With Roger Glenn – vibes, flute, sax; Ray Obiedo – guitar; David Belove – bass; Phil Hawkins – drums, and Derek Rolando – percussion. 8:00 pm. Sunday, April 27 – I’ll present a workshop ‘Music Transcription Techniques’ at The Jazzschool, Berkeley, CA, 2:00 – 4:00 pm. Transcribing music – listening to a recording and writing down what you hear – is an essential skill for every musician. Among its many benefits, transcribing is a powerful ear-training exercise and an extremely useful tool for learning improvisation and arranging. This workshop includes an overview of traditional pencil-and-paper techniques, a demonstration of software tools Sibelius and Transcribe!, and tips and tricks for developing your transcribing abilities. Suitable for both beginning transribers and those with transcription experience who’d like to add computer tools to their workflow. Friday, May 9 – with the Juan and Pete Escovedo Latin Jazz Group at Angelica’s Bistro, Redwood City, CA. With Pete Escovedo – timbales; Juan Escovedo – congas; Roger Glenn – vibes, flute; Ray Obiedo – bass; and Phil Hawkins – drums. Saturday, May 17 – with singer Lisa Andrea Torres at Vezer Family Vineyard, Suisun Valley, CA. With Celso Alberti – drums, and Sam Bevan – bass. Latin and Brazilian jazz. Friday, May 30 – with Ray Obiedo & Mambo Caribe with special guest Pete Escovedo at Club Fenix, San Rafael, CA. Latin jazz mixed with East Bay funk, with Ray Obiedo – guitar, Pete Escovedo – percussion, Alex Murzyn – sax & flute, David Belove – bass, Phil Hawkins – drums, and Derek Rolando – percussion. Sets at 8 and 10 pm. Sunday, June 1 – with Ray Obiedo & Mambo Caribe with special guest Pete Escovedo at Armando’s, Martinez, CA. Latin jazz mixed with East Bay funk, with Ray Obiedo – guitar, Pete Escovedo – percussion, Alex Murzyn – sax & flute, David Belove – bass, Phil Hawkins – drums, and Derek Rolando – percussion. 5:00 pm. Thursday, June 19 – with Conjunto Karabalí at Jessie Square, San Francisco, CA. Free outdoor concert, 6:00 – 7:30 pm, part of the Yerba Buena Gardens Festival. The return of Karabalí, one of the hardest-grooving bands I’ve ever worked with. Led by master percussionists Karl Perazzo (long-time member of the Santana band) and Michael Spiro, Karabalí plays conjunto-style salsa (no timbales), featuring classic repertoire from 70s and 80s New York groups and some burnin’ timba-inflected contemporary Cuban songs. Friday, June 19 – with Conjunto Karabalí at Club Fox, Redwood City, CA. Music starts 10:30 pm. Saturday, June 21 – with Ray Obiedo & Mistura Fina at the San Anselmo Art & Wine Festival, San Anselmo, CA. Brazilian and Latin jazz mixed with East Bay funk, featuring singer Sandy Cressman. With Ray Obiedo – guitar, David Belove – bass, Phil Hawkins – steel pans and drums, Colin Douglas – drums and percussion, and Derek Rolando – percussion. 8 pm. Saturday, June 21 – with Conjunto Karabalí at El Vacilon at the Oasis Bar & Grill, Treasure Island, San Francisco, CA. 8:30 pm. Sunday, June 22 – with Ray Obiedo & Mambo Caribe featuring special guest Pete Escovedo at Magnolia Terrace, San Rafael, CA. Brazilian and Latin jazz mixed with East Bay funk, featuring Ray Obiedo – guitar, Pete Escovedo – timbales, David Belove – bass, Phil Hawkins – steel pans, and Colin Douglas – drums & percussion. Music starts at 1 pm. Sunday, June 22 – with Conjunto Karabalí at The Seahorse, Sausalito, CA. Music starts 5:00 pm. Friday, July 18 – with Ray Obiedo & Mambo Caribe at Silo’s, Napa, CA. Latin jazz mixed with East Bay funk, led by guitarist/composer Ray Obiedo, with special guest Pete Escovedo – timbales, and Juan Escovedo – congas, David Belove – bass, Colin Douglas – drums, and Alex Murzyn – saxes and flute. 8 pm. Friday, August 15 – with the Roger Glenn Latin Jazz Ensemble at Angelica’s Bistro, Redwood City, CA. With Roger Glenn – vibes, flute, sax; Ray Obiedo – guitar; David Belove – bass; Phil Thompson – drums, and Derek Rolando – percussion. Music starts at 8:30 pm. Saturday, August 23 – with the Roger Glenn and the Rico Ritmo All-Stars at El Tecolote 44th Anniversary Celebration at the New Cesar’s Latin Palace, 826 26th St, San Francisco, CA. With Roger Glenn – vibes, flute, sax; Anthony Blea – violin; Orestes Vilató – timables; John Santo – congas; and David Belove – bass. 10 pm. This event celebrates the 44th anniversary of San Francisco’s English/Spanish biweekly newspaper, El Tecolote. Friday, August 29 – with the Pete Escovedo Latin All-Stars at Angelica’s Bistro, Redwood City, CA. With Pete Escovedo – timbales; Juan Escovedo – congas; Roger Glenn – vibes, flute; Ray Obiedo – bass; and Phil Hawkins – drums. Saturday, August 30 – with Ray Obiedo & Mistura Fina at The Downtown Theater, Fairfield, CA. With Ray Obiedo – guitar; Sandy Cressman – vocals; Jeff Cressman – trombone; Marc Van Wageningen – bass; Derek Rolando – percussion; and Phil Hawkins – drums. Music starts at 6:30 with opening acts 2d Planet and Michael Manring. Monday, September 1 – with Pete Escovedo at The Sausalito Art Festival, Sausalito, CA. With Pete Escovedo – timbales; Ray Obiedo – guitar; Marc Van Wageningen – bass; Roger Glenn – vibes, flute; Juan Escovedo – percussion; and Phil Hawkins – drums. 12 pm on the Main stage. Saturday, September 6 – with Conjunto Karabalí at The Seahorse, Sausalito, CA. Music starts 9:00 pm. Saturday, September 27 – with Ray Obiedo & Mistura Fina at the Redwood City Salsa Festival, Redwood City, CA. Brazilian and Latin jazz mixed with East Bay funk, featuring singer Sandy Cressman. With Ray Obiedo – guitar, Alex Murzyn – sax & flute, David Belove – bass, Phil Hawkins – steel pans, drums, Colin Douglas – drums, and Derek Rolando – percussion. Our set begins at 5 pm. Saturday, October 4 – with the Pete Escovedo Latin Jazz Ensemble at Oktoberfest, Oakland, CA. With Pete Escovedo – timbales; Juan Escovedo – congas; Roger Glenn – vibes, flute; Ray Obiedo – guitar; David Belove – bass; and Phil Hawkins – drums. Friday, October 10 – with the Pete & Juan Escovedo Latin All-Stars at Angelica’s Bistro, Redwood City, CA. With Pete Escovedo – timbales; Juan Escovedo – congas; Roger Glenn – vibes, flute; David Belove – bass; and Phil Hawkins – drums. Music starts at 8:30 pm. Sunday, October 26 – I’ll present a workshop ‘Music Transcription Techniques’ at The California Jazz Conservatory (formerly The Jazzschool), Berkeley, CA, 11:30 am – 1:30 pm. Transcribing music – listening to a recording and writing down what you hear – is an essential skill for every musician. Among its many benefits, transcribing is a powerful ear-training exercise and extremely useful for learning improvisation and arranging. This workshop includes an overview of traditional pencil-and-paper techniques, a demonstration of software tools Sibelius and Transcribe!, and tips and tricks for developing your transcribing abilities. Suitable for both beginning transribers and those with transcription experience who’d like to add computer tools to their workflow. 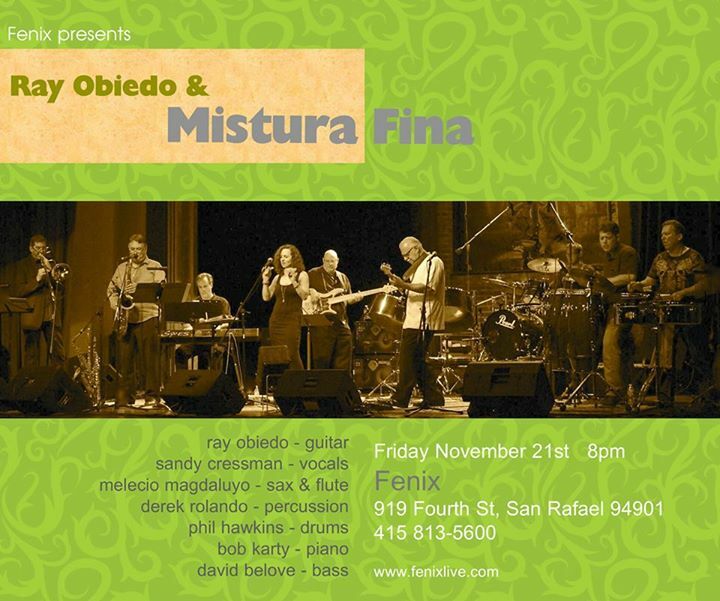 I’ll be playing two shows in November with Ray Obiedo & Mistura Fina. Brazilian and Latin jazz mixed with East Bay funk, featuring singer Sandy Cressman. With Ray Obiedo – guitar, Melecio Magdaluyo – sax & flute, David Belove – bass, Phil Hawkins – drums, steel pans, Colin Douglas – drums, and Derek Rolando – percussion. 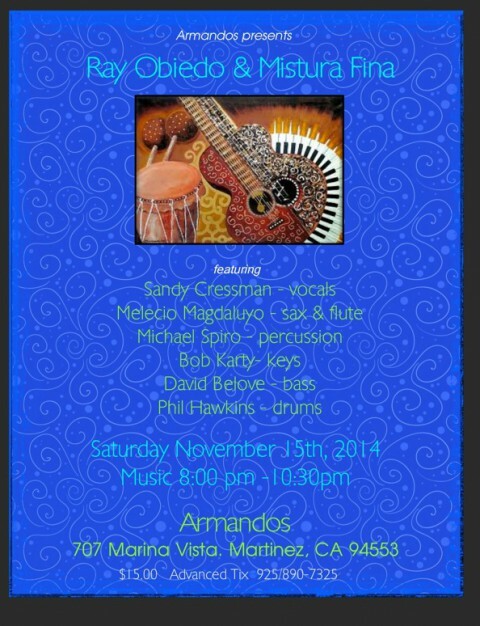 Saturday, November 15 at Armando’s, Martinez, CA. Two sets starting at 8 pm. Friday, November 21 at Club Fenix, San Rafael, CA. Two sets starting at 8 pm. Wednesday, December 31 – New Year’s Eve at La Peña, Berkeley, with La Moderna Tradición. Show starts at 9 pm.